When my kids were itty bitty, we would play a game- they’d hand me a cup of pretend tea and I’d say “Thank you!” Then, I’d hand them the cup back and they’d say “tee-too.” Back and forth we’d go, giving and taking and thanking one another, and starting all over again. 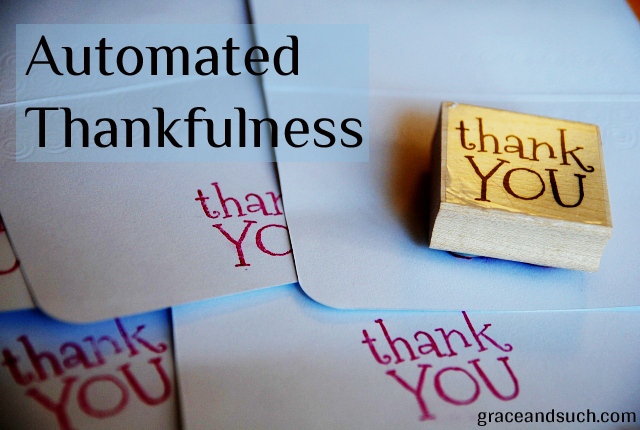 It got to a point when saying “thank you” became automatic- kind of like little well-mannered robots. After some time, it became embarrassingly clear that, though I taught my children how to appear grateful, I had never taken the time to teach them how to actually be grateful. To them, saying ‘Thanks’ was a reflex. They’d been well-programmed: someone gives you something, you say the words. But I didn’t want robots, I wanted to raise people who were gracious and appreciative and thankful. I had to get to the heart of the matter. To be truly thankful for what we have, we have to give up the idea that we deserve anything – lest we become entitled. 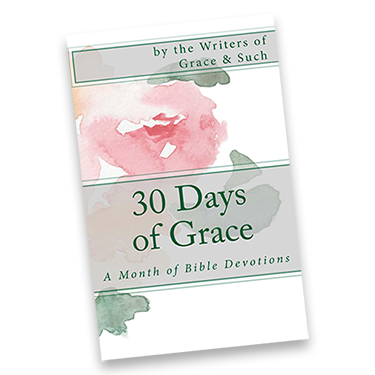 To have a grateful heart, we have to understand that every single thing that is given to us requires a sacrifice from the giver (even if it’s not a seemingly big sacrifice, see #1) – lest we become spoiled. To be truly appreciative, we need to purposefully notice what we’ve been given, lest we become discontent. It took many conversations in the years that followed to really establish the truth. We had to revisit the principles of gratitude over and over again until they sunk all the way in. The truth is that grateful behavior comes out of a grateful heart, not the other way around. We can control what our children do, but if we don’t take the time to go deeper, we are going to find ourselves with shallow, entitled, spoiled, discontent androids on our hands, and who even wants that? I was thinking about all of this the other day as I realized my prayer time has become a little stale. I try to start with gratitude when I pray: “Thank you, Lord, for my children, for my husband, for this home. I thank you for the beautiful gift of salvation….and here are the things I would like you to handle for me.” But I’m realizing lately that I’m becoming a little robotic. I say the ‘Thank Yous,’ but mainly just because I know I should, and I certainly want to take care of the praise before I start with the petitions. Looking at that truth up close was a little gross, to be honest, and it led me to think about the principles of gratitude that I worked so hard to teach to my children those many years ago. I began to realize that the reason my prayers have been going stale is because I am praying with an entitled, spoiled, discontent robot heart. I claim to desire a real, authentic relationship with Jesus- so why would I settle for cold, impersonal programmed gratitude? This year, as my family holds hands and bows their heads around the Thanksgiving table, I’m going to make an effort to take a look around, soak in the amazing gifts I’ve been given, remember that I deserve none of this and that it all comes at a price. I’m going to take a moment and let my heart fill with genuine, real, authentic gratitude until it overflows into true praise and thanksgiving. Isn’t it wonderful to know that the lessons we teach our children can be good for us too? “The truth is that grateful behavior comes out of a grateful heart.” Powerful in the simplicity of it. But as with so many things of God it takes attention to the simple to find the peace he wants for us. Thanks, Amber. As always, a thought-provoking post. Well, my son would argue that having robots would be way more cool than having people, but I’m with you. Love this. Every bit. Works from age 1-100. Thank you. Thank you for the comment, Diane. I have to remind myself of this all the time! Gretchen- clearly that duplicate answer wasn’t for you! I meant to say that I am with your son on some days. I’d really like to have a robot maid for sure! Thanks for your comment, lady. My daughter used to work for Chick Fil A. It’s been several years, but when someone says “thank you” to her she’ll still respond with “my pleasure.” I then ask her, “is it really?” We’re just joking around, but it’s the same idea here. I kind of want to cross stitch your three principles of gratitude on a pillow so I will be reminded often! Thanks for another great post, Amber! Jen- I totally hear you! So many things go on autopilot- it’s hard to slow down and remember to mean what we say! This really struck a chord with me. Every Thanksgiving, my granddaughter who is now 11, loves to make suggestions or little notes to help the ‘thanks’ flow around the table as a part of the tradition. I actually stole some of your concepts to use this year. I will have her distribute small handmade cards, which will each have a different ‘prompt’ in them. I think it is going to be a valuable time together, and hopefully will initiate some important thinking about being purposefully Thankful. thank you and HAPPY thanksgiving!! God Bless you. That’s such a fun tradition! Please come back and tell us how it goes!